The importance of the aerobic system and the ability to utilize oxygen at an efficient rate is well understood in regards to the performance of many athletic competitions. This can easily be realized due to the increased respiratory exchange in order to match increased activity levels. In the majority of athletic events, as an athlete fatigues, they will increase their breathing rate in an attempt to increase the amount of oxygen received by the body. This increased breathing rate is completed with the idea that oxygen is limited in these scenarios. However, this “over-breathing” may actually lead to a decrease in performance abilities, as oxygen is rarely the limiting factor in aerobic fitness. There is no doubt oxygen is a critical aspect of both everyday life as well as performance. The utilization of oxygen is imperative for the high-level functioning of the oxidative energy system. This energy system functions at lower intensities to allow longer distances to be covered at a slower pace. This quality is also vital for recovery from high-intensity activity, which are commonly required in team sports. This energy system, which requires oxygen, serves as the foundation for the other two energy systems required in competition. Without it, performance will be limited in almost every aspect. Training adaptations realized with the improvement of the oxidative energy system range from increased oxygen availability to improved fat metabolism, which makes training and performing less fatiguing on the body. The importance of the oxidative energy system becomes clear when comparing an athlete’s ability to control their heart rate. An athlete with a highly trained oxidative system can complete tasks at a much lower heart rate than an athlete not trained in this performance quality. This means athletes trained in this energy system can function at much higher intensities while maintaining an extremely high level of efficiency, ultimately meaning they can do more work while expending less energy. Many coaches understand the value and importance of a highly functioning aerobic system, but what if the oxygen availability, or the intake of oxygen, is not the limiting factor in this energy system. If this were the case, all of the increased breathing rates, which are completed in order to increase oxygen availability, would not lead to an increase in performance. Again, we are in no way undermining the importance of oxygen in performance, but rather, questioning if more oxygen is always “better”. “The Oxygen Advantage” by Patrick McKeown serves as a guide to answer this question and can be implemented in many training aspects to maximize the function (both output and efficiency) of the oxidative energy system. Many of the methods demonstrated throughout this article are implemented from the concepts presented in this book. The primary questioning of “is oxygen intake the limiting factor in performance?” comes from the blood saturation levels. Even during high-intensity exercise, blood saturation is around 95-99%. This means that even with an increased breathing rate, oxygen amount available will not increase to a great extent, if at all, as the blood is almost already fully saturated. For this reason, training techniques must focus on an increased utilization and efficiency of this available oxygen within the blood. Prior to diving into the other concepts and methods to improve the efficiency oxygen is utilized within the body, it is important all coaches understand the ventilator system from a basic standpoint. Both the rate and volume of inhalation and expiration are determined by receptors in the brain that work similar to a thermostat. As an athlete inhales, oxygen is brought into the lungs, where it can be taken by the blood to the desired parts of the body. Carbon dioxide is then exhaled as the athlete breathes out. It is this aspect that the thermostat in the brain is responsible for monitoring, along with pH level. As the carbon dioxide levels within the body increase, the thermostat increases breathing rate in order to expel this gas. However, when this cycle is completed excessively over the course of months, years, and even decades, the thermostat can become increasingly “sensitive” to changes in carbon dioxide. Meaning less carbon dioxide is required in order to increase an athlete’s breathing rate. As this sensitivity continues to increase, the thermostat kicks on the increased breathing rate at a lower carbon dioxide level. Ultimately repeatedly reducing the amount of carbon dioxide the body views as “excessive”. This can be seen in the figure below. The blue and orange lines may represent either the same athlete at different times, or two individual athletes. Either way, the blue line demonstrates an athlete capable of tolerating increased levels of carbon dioxide, while the orange line shows the increased sensitivity to carbon dioxide, leading to increased respiration at a lower accumulated carbon dioxide amount. This lower tolerance of carbon dioxide, demonstrated by the orange line, may seem beneficial to an athlete initially, as they are ridding their body of “excess” carbon dioxide. However, as the body continues to lower the amount of carbon dioxide it can tolerate, the athlete will not only experience increased respiratory rates at a lower carbon dioxide amount, but the amount of oxygen released from the blood will also continue to decrease. This reduced release of oxygen from the blood is due to its direct relationship with carbon dioxide. As carbon dioxide increases, hemoglobin releases oxygen. Meaning the athlete that has a reduced threshold of carbon dioxide, will have increased oxygen levels in their blood, as the oxygen is not released from the hemoglobin into the working muscles. This clearly demonstrates the purpose of carbon dioxide being much more than a “waste gas”, as it is the key variable driving the release of oxygen from the red blood cells to be utilized throughout the body. This reduced release of oxygen from the blood leads to a decrease in potential performance. This performance decrement is realized not due to a lack of available oxygen, but rather that not enough oxygen is being released from the blood to be utilized by the tissues and organs. This can be easily seen by the saturation level of oxygen in the blood, which is consistently above 95%. Chronic “over breathing”, or “mouth breathing” at low intensities, leads to too much carbon dioxide being expelled from the body, thus increasing the amount of bound oxygen to hemoglobin. As this type of breathing occurs over extended periods of time, the brain sensors or thermostat, becomes increasingly sensitive to the build-up of carbon dioxide. Ultimately leading to increased “over breathing” as the body attempts to rid even the smallest accumulation of this gas. Returning to the figure above, if an athlete is biologically and physiologically capable of functioning at the blue line, but has become increasingly sensitive to the accumulation of carbon dioxide, as the orange line demonstrates, they will experience fatigue to a greater extent. Until the athlete is trained in a manner to increase their tolerance of carbon dioxide, they will not utilize the oxygen in their blood efficiently. Oxygen continues to be vital for optimal performance. However, if an athlete is not capable of utilizing it effectively, training progress and performance will be dampened. It is important to note that each individual will have their own “maximal threshold” for carbon dioxide tolerance. The key is to train each athlete to achieve the ability to function as close to their own, individual, maximal threshold as possible in their respective sport. With these previously described concepts, the goal of maximizing the efficiency of the cardiovascular and respiratory systems can be achieved through multiple adaptations. These adaptations include increased tolerance of carbon dioxide, increased nitric oxide production, and finally the increase in the number of red blood cells. Each of these can be achieved through the specific implementation of breathing techniques in order to reduce “over-breathing” which is experienced commonly amongst athletes. Firstly, the tolerance of carbon dioxide must be increased for each individual athlete. As this tolerance increases, over-breathing will be drastically reduced as the thermostat will require higher levels of carbon dioxide prior to increasing breathing rate, allowing the disassociation of oxygen from hemoglobin to be utilized by the working tissue. The most simple of alterations to breathing can improve this tolerance. Simply requiring an athlete to breathe through their nose can lead to drastic increases in carbon dioxide capacity. When an athlete breathes only through their nasal cavity, the amount of carbon dioxide they are able to expel will be reduced, thus increasing the amount contained within the body. As with any adaptation, progressive overload is critical to the desired change. Nasal breathing will naturally allow an athlete to set the pace they are capable of maintaining throughout the duration of the training session, or prescribed nasal breathing time. 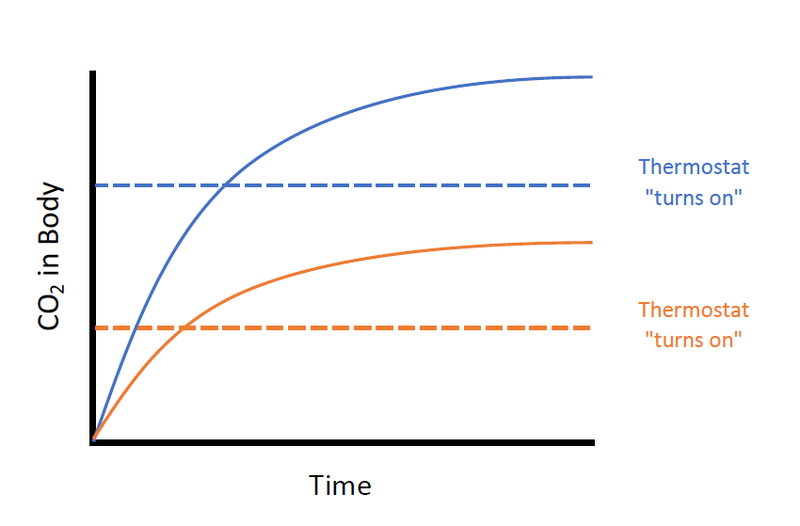 This understanding allows a coach to view which athletes are capable of tolerating higher levels of carbon dioxide, as they will be capable of moving at a faster pace than those with a lower tolerance (blue line vs. orange line in the figure above). With the pace being controlled by the ability to withstand carbon dioxide build up due to nasal breathing, coaches can quickly realize the changes in an athlete as their “thermostat” for carbon dioxide becomes active at higher thresholds. Ultimately allowing more oxygen to be delivered to the working tissues. Nasal breathing not only intensifies the accumulation of carbon dioxide within the body, but also increases the production and utilization of nitric oxide. Nitric oxide is important for vasodilation, and is commonly associated with many pre-workout supplements to increase one’s “pump” due to increased blood flow. Although the intake of these supplements orally is not as well proven to increase vasodilation, the nitric oxide produced from inside the nasal cavity is exceptional with this task. By utilizing nasal breathing, not only is carbon dioxide tolerance increased, but the dilation of the blood vessels will increase the amount of blood that can reach the desired muscle/organ/tissue. The increased vasodilation is an important aspect of the third adaptation goal, which is to increase the number of red blood cells. If an athlete were to only increase their vasodilation, they will likely experience some improvement in performance. However, by combining both the vasodilation as well as an increase in red blood cells (which carry oxygen), an athlete can continue to realize their highest potential in regards to aerobic fitness. By having an athlete hold their breath, even for a relatively brief period of time, the saturation of oxygen in the blood decreases. This decrease is due to the increase in carbon dioxide driving oxygen to be released from the hemoglobin where it can enter a working muscle. As the body experiences this reduction, it rapidly attempts to increase the number of red blood cells to increase the oxygen carrying capacity. A major component of this rapid increase in red blood cells is due to the contraction of the spleen, which stores these red blood cells until the signal to contract and release them is given. Even with breath holding for a mere thirty seconds, significant contractions, and then a reduction in spleen size have been seen. This demonstrates the red blood cells that were in “storage” were released, leaving the spleen in a much smaller state than prior to the contractions. Erythropoietin (EPO), which is commonly used as a form of blood doping, can see a significant increase due to holding ones breath. Increases of up to twenty-four percent have been seen due this technique. Clearly this is a method that will further enhance oxidative performance in athletes of all competitions. Through the use of these breathing techniques in training and everyday life, an athlete has the ability to maximize the performance and efficiency of their oxidative energy system. When combined and trained appropriately, an athlete will experience a reduction in “breathlessness” as the body is able to complete a greater metabolic demand with far less effort. The remainder of this article will demonstrate how to implement these breathing techniques within training in order to achieve these desired, critical adaptations. A simple method to determine an athlete’s baseline is through the use of the “Body Oxygen Level Test” or BOLT score. This is a simple, quickly completed protocol utilized to determine the sensitivity of an athlete to carbon dioxide. This protocol is laid out entirely in the book mentioned earlier; “The Oxygen Advantage”. In order to test for an athlete’s “BOLT” score, simply have them exhale through their nose and ensure no inhalation occurs. Once this is completed, time the seconds until the urge to breathe occurs. It is important to note that this is not a maximal breath hold exercise, simply have the athlete continue until the first urges to breathe are experienced. As the athlete finishes, they should be able to return to normal, light breathing immediately. Ideally, an athlete will have a BOLT score above 30, and any BOLT above 40 is considered a high enough score that breathing is already functioning in a highly efficient manner. As an athlete’s ability to tolerate carbon dioxide increases, the first urges to breathe will occur at a later amount of time. This is a simple, yet effective method to test for an athlete’s sensitivity to carbon dioxide build up. Once a coach has determined the BOLT score of each athlete, the methods described earlier can be implemented throughout training. The utilization of these methods will ultimately be determined based on the program created by the coach. The example for these breathing techniques and their use throughout training is presented in a block manner, which is programmed with specific training goals in mind. To read more about the goals of this program, click here. The block training principles can be read about to a greater extent here. With the first primary goal of training being to maximize the fitness of each athlete, the breathing techniques can be easily implemented to further enhance the adaptations realized through training. With the block training approach, paired with the understanding that the oxidative energy system serves as the foundation for all other physical attributes, training is first designed to increase the function of the aerobic energy system. As this training phase is completed with a higher volume and a (relatively) low intensity, the ability to nasal breathe throughout training becomes possible. Training programs such as the Superendurance, Sandbell, 1 Rep EDT, Fast-Twitch RSA Sequencing, Parts I, II, and III, and 3-D Contralateral circuits can all be implemented with this breathing requirement. Coaches must continue to realize that each athlete will have an individual pace to compete these based on their tolerance to carbon dioxide build-up. This is why the knowledge of an athlete’s BOLT score is so critical in training. The knowledge of their BOLT score will allow a coach to easily tell if an athlete is slowed due to their lack of effort, or if they are simply unable to keep the same pace due to their increased sensitivity to carbon dioxide. The primary adaptation to this training phase is the increased tolerance of carbon dioxide, on top of the changes due to the heart, lungs, blood vessels, and other cardiovascular aspects realized due to the training completed. 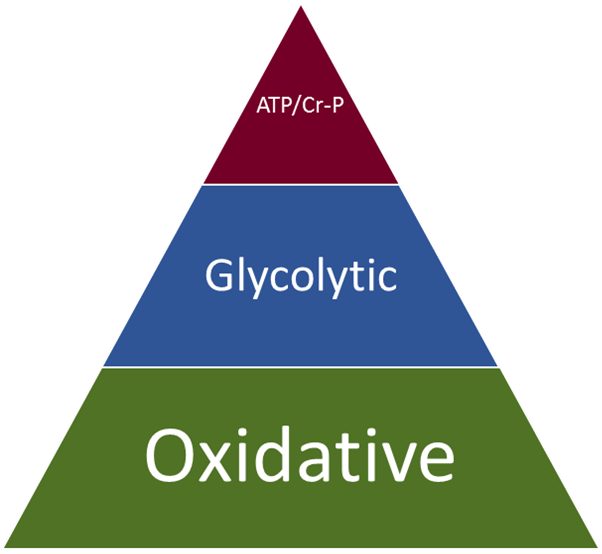 After the oxidative, or aerobic training phase has been completed, a training phase specifically for the glycolytic energy system can be implemented. At this point in training, nasal breathing is well adapted by athletes due to the previous training phase. They are now prepared to focus on driving carbon dioxide levels up to an even greater extent as their sensitivity has decreased. This can be completed through the use of breath holding. As discussed previously, the increased carbon dioxide leads to oxygen saturation levels decreasing and a rapid release of red blood cells from storage. The increased hemoglobin can now rapidly be utilized to carry oxygen to the working tissue, which becomes important in this training phase as the athlete is pushed to their metabolic limits. Breath holding for a mere 25-30 seconds can lead to a drastic ability to complete steadily increasing workloads and enhance adaptations to a greater extent. A simple example of this is the use of breath holding before the completion of an escalating density training (EDT) program. In this session, athletes complete as many sets as possible between an upper and lower body movement for ten repetitions each. This is an extremely taxing style of training and is only completed a few times within an annual phase. However, by implementing specific breathing protocols, such as breath holding, a coach is able to get more “bang for their buck” out of the session, and thus achieve a higher stress response and resultant adaptation. As an athlete is able to increase their workload in the allotted time, they are clearly capable of doing greater work in the same amount of time. One of the more remarkable aspects noticed by a coach is the rapid recovery, even after a difficult, “all-out” style of training is completed for an extended period of time. After about twenty-five to thirty seconds, athletes will be back to their light, “normal” breathing, even when training at altitude where oxygen is limited. This all occurs after five minutes of training at the highest intensities. Clearly this will be beneficial for almost every athlete in either training or competition. This is in part due to their increased oxygen carrying capacity and further enhancing their carbon dioxide tolerance. These breathing methods can also be implemented for reasons outside of the specific training of the energy systems, as described above. Nasal breathing and breath holding can be used to increase the “internal stress” on the body, and also for enhanced recovery. Both of these aspects can be critical for optimal performance during the long and vigorous in-season phases many teams experience. It should be noted as the intensity of the completed activity increases, there will become a point at which nasal breathing is simply no longer possible. It is only in these intense situations that mouth breathing should be utilized. This will ensure athletes are not “over-breathing” and are, at the very least, maintaining their tolerance to carbon dioxide and are utilizing oxygen efficiently. Based on the principles of the general adaptation syndrome, there are absolutely certain periods of time that require reduced stress levels in order to allow recovery and adaptation. These time periods, or “downloads”, are consistently implemented in training, particularly during the competition season. During this training, an athlete may already be experiencing a high level of stress on their muscular tissue from the stressors of practice and/or competition. By implementing nasal breathing, coaches are capable of continuing to stress the cardiovascular system and ensure fitness is not lost throughout the season while allowing rest to the muscle tissue itself. This ultimately allows a coach to achieve the same response from the internal systems, with a smaller amount of stress placed on the external tissue. This concept can also easily be implemented in a return to play protocol, when an athlete’s tissue is not necessarily prepared for a high amount of stress, but fitness qualities would like to be maintained or improved. The breath holding technique can also be used for rapid recovery during times of repeated high stress, such as multi-game weekends. By having an athlete complete breath holding, the splenic contractions resulting in the release of red blood cells can be applied to increase blood flow throughout the body. When paired with appropriate nutrition and active recovery methods, this can drastically improve the rate of recovery when needed. Coaches must continue to understand the limiting in factors in performance. In the case of oxygen utilization, based on the saturation levels found in the majority of athletes at all levels, it is not the intake of oxygen that is the limiting factor. Instead, it is the effectiveness of the utilization of oxygen, which can only be realized to the fullest when an athlete is capable of tolerating a high level of carbon dioxide. Training to continuously “keep the goal the goal” and understanding the specific requirements to achieve the desired adaptation and improved performance must be maintained at all times. The breathing techniques demonstrated throughout this article are simply one method available to maximize the performance of the utilization of oxygen throughout training and performance.